I enjoy all your fiction here, but especially how you translate the game action into these narratives. 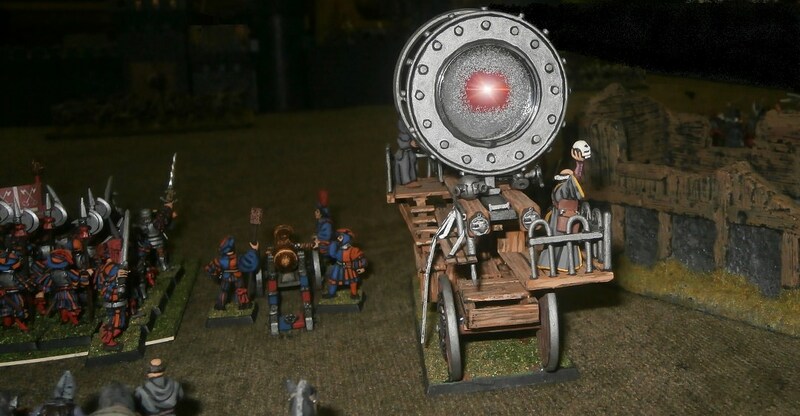 As the huge siege tower trundled on, the cultists to its left marched more speedily, soon catching up with it. 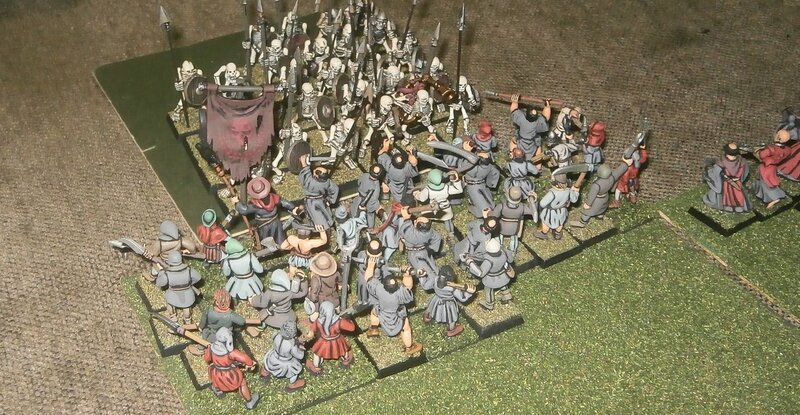 In the centre of the field the generalis praepositus wasted no time in ordering his own regiment of cultists on, towards the gate and mob of stinking undead guards. As they moved their bell rang out, its sombre tone part and parcel of the practices they employed to bring on a furiously frenzied state of being. 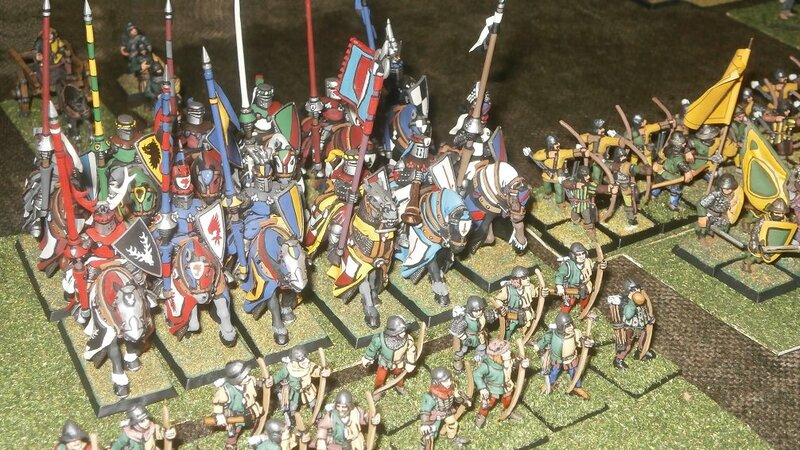 The city guard in the centre of the line stayed put for now, but on the right the large crowd of Urbimans advanced, with their lord riding up behind them. … hoping to scorch right through the foe to bring down a whole file. By turning two geared, iron wheels, they rotated the screw-like shaft running the engine’s length, finely adjusting the distances dividing the giant lenses better to suit the range of their intended flash. Then the engineer opened the shutter of a leaden lantern containing the eerily glowing gem responsible for initiating the process. The loosed light projected out to reflect via two concave mirrors onto the first of the several linearly-placed lenses. The glass of each lens was fashioned from a potent combination of molten, fine, white sand and pounded warpstone, subsequently ground precisely into shape to ensure the light penetrating through each of them was not only concentrated but incrementally fed by the winds of magic, transforming from a ray of bright, hot light laced with raw magic into a beam of such heat as could turn a man to ash at a distance of hundreds of yards, and of such potent magical power as could instantly dissolve even the otherworldly forms of ethereal creatures. A light now appeared in the rear-most, largest lens - that which the maestro da Leoni had called the ‘bonaventure lens’ - tinged blood red but piercingly bright at its core. The engine began to shake, its component parts clattering so much that the draught horses, selected specifically for their docility and ability to withstand the sounds of battle, began to buck and strain at their harnesses. The engineer, clutching the rattling railing which hemmed his platform, felt his stomach knot as he realised that this was going to be a more massive blast than any they had achieved in Remas during their practises. His rim of white hair suddenly stood on end, and he could hear a fizzing sort of sound accompanied by the distinctive smell of singed wool which presumably was coming from his own robes. There was a sound akin to a giant intake of breath, and then a searing bolt was loosed through and from the machine which stretched right over to the skeletons, tearing apart an entire file of five into tiny fragments of scorched bone and dust. This was followed immediately by a loud cracking sound as the mizzen-lens (being the second last last) broke in two. All hint of the light instantly vanished, and for a moment the engine’s crew felt the breath sucked from their lungs. Once they had recovered, and quite literally regained their breath, the engineer scrutinised the cracked lens. His shoulders slumped as he realised that what had just happened would be the engine’s only contribution to the battle. He caught himself just in time before taking Morr’s name in vain and began a prayer of cleansing to wash away any taint of his sinful intention. The cannons, however, had much more luck. The first sent a ball right through the zombies, spattering five of them, then continued straight into the city’s gate, shattering the wood so badly that the hole thus made was sufficient even for men to enter (if a little uncomfortably). The second sent a shot smashing into the wall upon which the duchess herself was stood, shaking it somewhat. The three companies of crossbows took down several handfuls of zombies, skeletons and ghouls. Upon the southernmost tower, Lord Adolfo scowled at the approaching siege tower. It had been fashioned somewhat simply of large planks, its only decorations being a huge painted cloth upon the front and a flag atop. Both these sported variations of the same design, an emblem Adolfo had seen previously in both life and undeath. It was one of the more popular symbols of Morr, consisting of an hourglass containing the sands of time, flanked by two raven wings. It was not trepidation he felt, nor anger, and certainly not fear, but rather impatience. He yearned to tear apart whoever lurked within the tower, to rend them limb from limb and bathe in their blood. And he wanted to do it now! 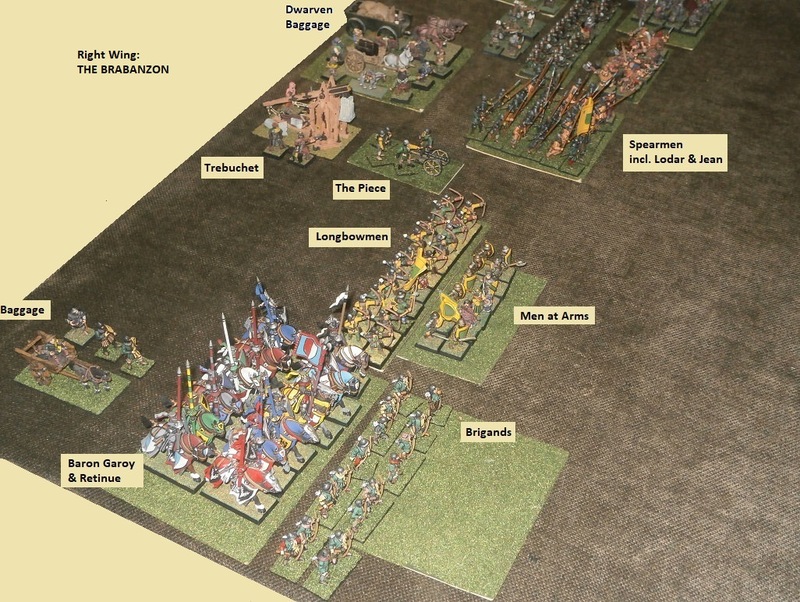 As the skeletons to the north of the city advanced, and the zombies shuffled a little forwards, the vampires and necromancer on the walls conjured what magic they could (Game note: magic dice 10:9 due to several dispel pool boosting artefacts in the Holiest Army) to resurrect several of the fallen zombies and skeletons. The duchess herself focused her hocus pocus on the Urbimans, conjuring Curse of Years upon them to kill nine immediately. … which the god of death graciously granted, but otherwise the holy men could effect little else. Both cannons further shook the wall upon which the duchess stood (Game Note: now up to +3 on all future rolls on the damage chart) which at last made her wonder whether she ought to remain there, risking the ignominious fate of becoming buried in rubble. The other vampire lord, Adolfo, was also (in his own way) in a thoughtful mood. 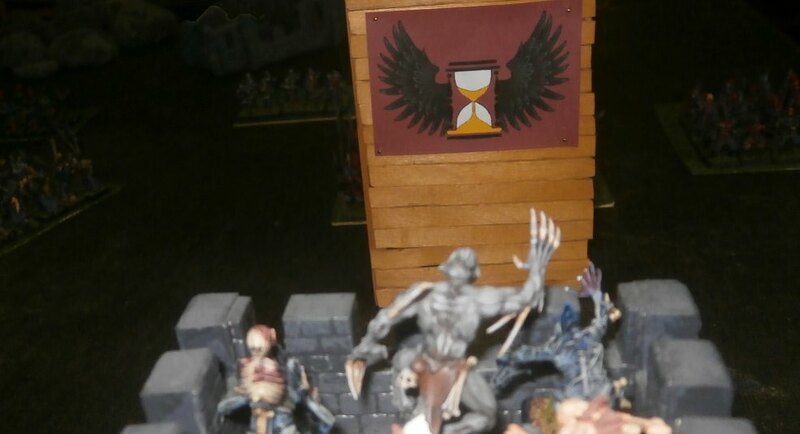 So keen was his passion to slay the occupants of the approaching tower that he failed even register the large body of cultists advancing beside the tower, heading for the currently unguarded wall behind the tower. Once again crossbow bolts were loosed by the dozen, this time with arrows from the horse soldiers too, but these volleys caused only a peppering of casualties, insufficient in number for the vampires or necromancer to even notice. The spirit hosts, being the bound souls of Viadaza’s most ancient warriors, now issued through the stone of the northern walls. Their ethereal forms seemed woven of shadows, the upper reaches of which were (impossibly) imbued with a greenish glow. The vampires employed a cursed book to wither the dedicants accompanying Carradalio and his admonitor, Brother Vincenzo, though to look at them you would barely have noticed the difference such was their fury and fervour for the fight. Last edited by Padre on Thu Jun 28, 2018 5:34 pm, edited 1 time in total. I'm sure I can rustle up a spare lens for future games, Lands Annex! Now the Holiest of armies launched several charges. In such close proximity to the foe, the dedicant crossbow could not restrain themselves and so charged into the newly raised zombies despite the entreaties of their shepherd to restrain themselves. Despite their small size their flagellations caused the death of four of their own number, and such was the fury this self-mutilation instilled that they tore down eight of the zombies with the further loss of only one more of their own. The remaining zombies all collapsed as the magic re-vivifying their rotting frames petered out. Gripped by a similar lust for battle, Father Carradalio and Brother Vincenzo jointly led their own regiment into the swollen mass of zombies before the gate. Carradalio personally cut down two of them, while his warriors slaughtered another thirteen. The still moving zombies reeled from the blow, unable to inflict any harm back, and fifteen more of them collapsed as they also succumbed to the effects of diminishing magic. 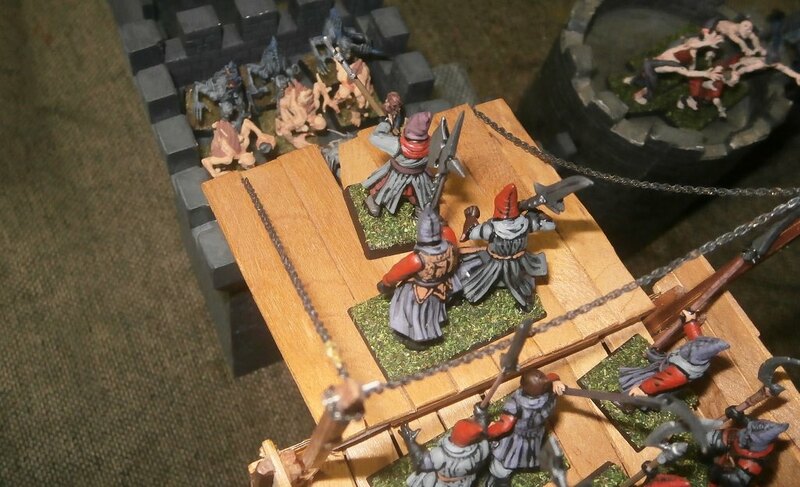 On the left of the attackers’ line, the siege tower at last reached the tower and lowered its drawbridge, allowing the halberd-wielding cultists to pour forwards. Four of their own number perished to their frenzied flagellations, but the god Morr filled the rest with an overwhelming bloodlust as a consequence. They now cared not a jot for their own defence, only that they could rain blows down upon the foe. But the vampire Lord Adolfo was waiting for them, and they now discovered just what such a creature was capable of. Eight of the cultists died from his attentions (Game note: Strigoi ghoul king with Sword of Bloodshed and vampiric Red Fury). The ghouls on the tower with Adolfo butchered three more of the cultists, while eight of their own number died. The Disciplinati di Morr dedicants had failed to take the wall-tower, losing both the initial impetus of their attack and also their frenzied mania. They would not break and run, determined as they were to die to a man in Morr’s service. That did not mean that they would win, only that if they lost none would be left alive. One of the dedicants climbing the ladders to reach the fighting platform, whilst corpse after corpse tumbled down from the mayhem above, glanced over to the regiment making for the neighbouring wall. In a sickening moment of clarity it occurred to him that unless the others ascended the wall almost immediately, attacking whatever was defending the tower immediately, then his own regiment would perish to a man before they even got into the fight. Not that he was afraid of death, for he was blessed by Morr, just that he realised that if the others were too late, then whatever was killing his own comrades so quickly would simply turn on them to do the same. And then neither wall nor tower would be taken. For a moment he felt a pang of despair, but he brushed the feeling away with an angry shout and continued his climb. While these fights broiled, the priests managed to dispel the withering curse affecting the Urbimans. One cannon again shook the wall violently (yet it still did not fall) but the other failed even to shoot, and the hail of crossbow bolts shot up at the walls did little more than clatter and clunk against the stones. The skeletons to the north of the walls chose not to wait for the enemy and hurled themselves into the horde of Urbimans before them. The ancient, undead warriors brought down three of the dedicants, merely matching the harm the dedicants own scourging had caused to themselves. Such was their frenzy that the Urbimans failed to notice and cut down a dozen skeletons. Near the now open gate Father Carradalio’s sword continued its bloody work, hewing apart another pair of zombies. These two truly dead corpses were joined by eighteen more. Only four of the dedicants perished, three by their own flails! The last half dozen zombies fell as all vestiges of the magic animating them vanished. The way to the gate was clear. The Necromancer upon the tower now read from his book, conjuring a curse which sapped the strength of the dedicants upon the siege-tower, so that some even struggled to ascend the ladders. This did not help their fight. Three died from their own flagellations, eight more from Adolfo’s attentions and a further two perished at the hands of the ghouls. What few were left fought on (Note: Unbreakable) but more of them were coming to the realisation that the regiment approaching the wall with ladders was not going to make it in time to save their complete obliteration, and that this would probably mean that regiment would be destroyed in turn. 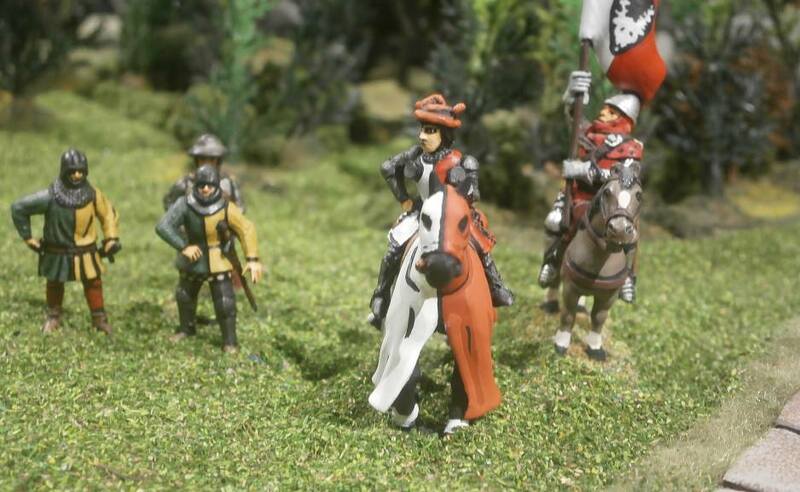 The Duchess Maria finally decided to quit the unstable wall and join her Black Knights in the yard below. She commanded them to move forwards a little towards the gate, for she intended to charge whatever came through it. Stirring stuff - great to see you still at it bud! Thanks Thantsants. I'll be doing this til the day i pop my clogs! Just as Father Carradalio was about to order his regiment to charge through the broken gate, Brother Vincenzo shouted, “No, Father! They are waiting in strength.” He had seen the undead horse soldiers massed within and knew that if any who entered there would likely be cut down to a man. Father Carradalio nodded, then pointed at the wall by the gate, commanding, “Ladders. Up!” at which the dedicants rushed to place the ladders and begin their climb. What resulted was short, but bloody, work, even though neither the priests’ prayers nor Brother Vincenzo’s holy, burning water harmed the foe. Four dedicants collapsed from their own self-punishment, and another four were slain by the ghouls upon the parapet, but Carradalio beheaded two of the foe, Vincenzo another and the dedicants smashed five skulls. The few ghouls left scuttled away and with a leap Carradalio and the first of his dedicants were on the wall. Note: See Appendix below for actual ‘in game’ version of this moment! 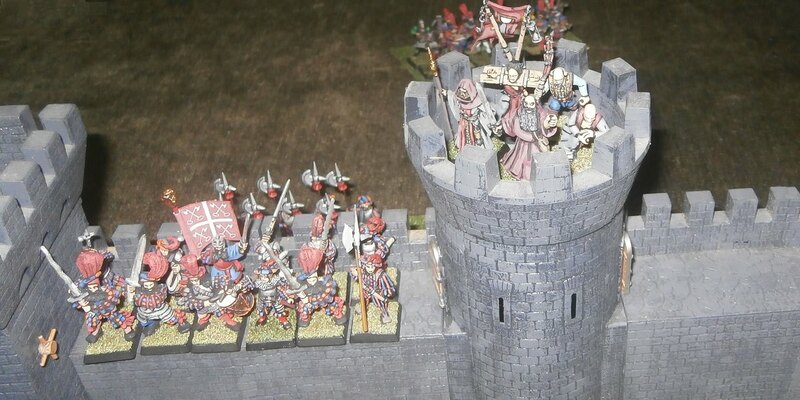 … they did not yet know that the vampire Lord Adolfo and his ghouls had already defeated the dedicants on the siege tower. All forty were either dead or maimed so badly they could no longer fight (many wounded by their own hands). … and between them and the Urbimans they cut every last one down. 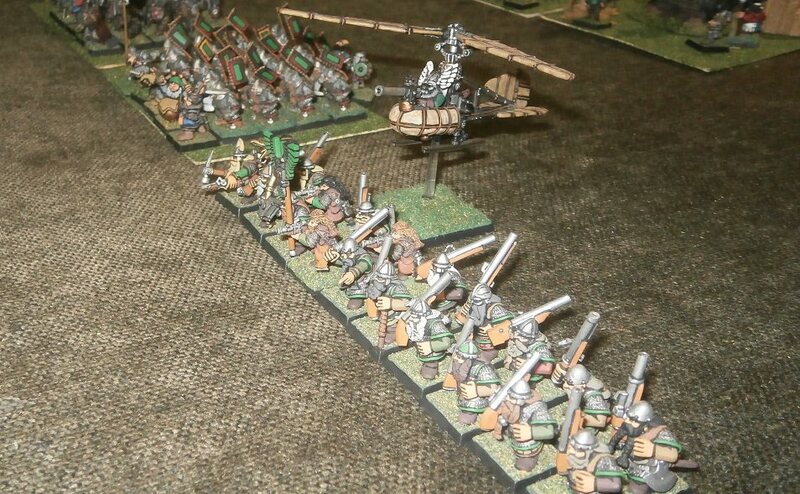 The crossbowmen, realising that the spirit hosts were behind them, moved over the bony remnants to put a better distance between them and a foe they could not hope to harm, while the Urbimans reformed themselves as they realised they could become the spirit hosts’ chosen target. Behind the Urbimans, the torch-wielding dedicants of the praepositus generalis’ bodyguard manoeuvred as best they could, frustrated in their efforts, knowing that their blessed, burning torches could easily dispatch the spirits if only they could get to them. While one cannon was being made ready again after its earlier misfire, the other cannon sent a shot that brought down the parapet of the wall where until moments before the duchess had been standing. Four of the grave guard became buried in the rubble, and three more succumbed to the crossbow bolts and light horsemen’s arrows which found their marks much more easily now that there was no wall in the way. The rest of the guards simply stood as they were, entirely bereft of any trepidation concerning whether the wall was about to collapse fully. At the very moment the leading dedicants upon the captured, southern wall turned towards the door into the tower, it burst open with such force as to rip it off its hinges, and Lord Adolfo, filled with a furious rage, leaped out to tear into them. He was followed by his ghouls and the fight that ensued was even bloodier than the previous. Adolfo alone killed eleven cultists, while the ghouls cut down another nine. What with another cultist perishing from his own self scourging, it all added up to twenty dead cultists, while only seven of the ghouls had been killed. Of course, the dedicants of the Disciplinati di Morr fought on, more and more clambering over the parapet to die almost instantly, even though none now harboured any hope that they might survive. 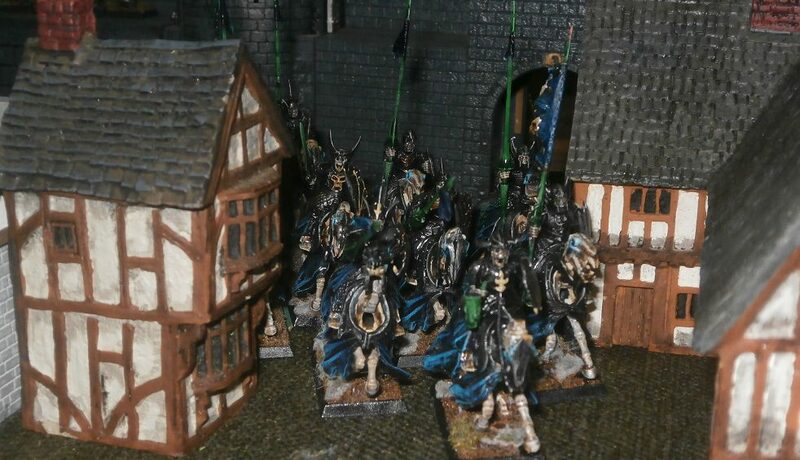 Father Carradalio, however, and what few warriors were left to his regiment, were doing better, losing only five of their number whilst killing nearly twice as many ghouls. Such was the weakening of the necromantic forces binding the ghouls, that the necromancer with them now succumbed to true death, along with the one or two ghouls remaining. Just before entering the round tower beside him, Carradalio looked down into the city and his eyes locked with his greatest enemy, the vampire duchess herself. She was sitting side-saddle upon her red-barded steed, looking deceptively delicate in her posture, but there was nothing but pure evil in her eyes. Carradalio smiled, such was his joy at leading his holy warriors into battle, knowing that Morr was by his side. The duchess snarled and watched through narrowed eyes as the priest stepped through the door out of her sight. He had but three warriors left with him, and his admonitor Brother Vincenzo, yet he still had confidence that victory would be his. Captain Vogel’s elite palace guard were approaching the gate with the Urbiman priest amongst them. The cannons were still booming and every undead warrior outside the city had been killed. What he did not know, until he got to the top of the tower, was that Adolfo had now slain the entire second regiment of dedicants attacking the southern wall. With a little help from his ghouls (and the enemy themselves) he had obliterated 70 dedicants. All the while he had been reanimating his fallen soldiers so that when he left the wall and hurtled down the street immediately behind, heading towards the duchess, he still had ten ghouls with him. The spirit hosts passed back through the city walls, intending to attack whatever force attempted to climb the northern wall even as it did so. The duchess now decided that her black knights could surely deal with whatever came through the gate on their own, so she leaped from her mount and made her way into the round tower immediately north of the gate, with a mind to fight her way through whomsoever got in her way and kill the laughing priest. Before she could reach the wall on the southern side of the gate, however, Captain Vogel and the palace guard employed the same ladders Carradalio and the cultists had used to ascend the wall also. The battered wall occupied by grave guard had been hit several more times and was now on the verge of complete collapse – a man leaning up on it might cause it to topple. Several more skeletons had been killed by crossbow bolts, and the rest of the Holiest Army’s regiments had moved closer to the walls. 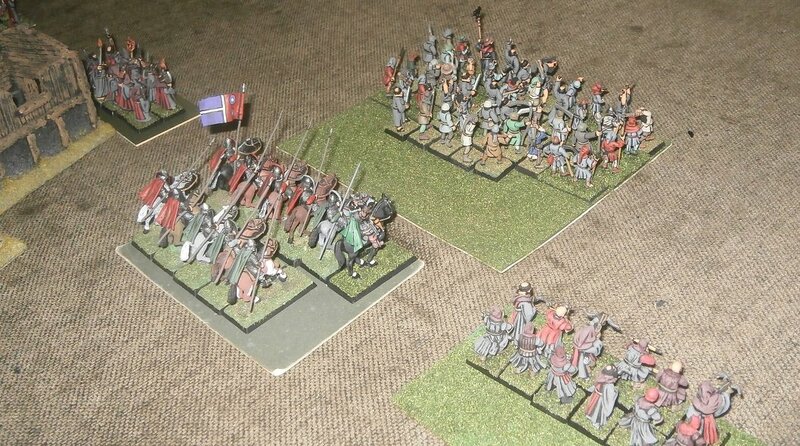 The Urbimans and a company of crossbowmen were ready to attempt charges to capture more of the walls. The Duchess Maria had sensed her servant’s anguish at the stinging power of the enemy’s prayers, and it suddenly dawned on her that if she and Adolfo attacked the walls and the tower they could almost certainly cut down all opposition and most likely even the two priests of Morr, but there was a small but real chance she could fail. Adolfo had been weakened and if only one Morrite survived that might be sufficient to finish him. She knew not what other tricks these priests had up their sleeves. The wall behind her was about to collapse, and Morrites were closing in to capture several other sections. She had sent most of her army’s fighting strength away with Biagino, and this guard force she had kept here in Viadaza had proved too weak (if only just) to defend against these cultists. The enemy’s dead were piled high, yet still they came on in frenzied fury - fearing neither death nor undeath, and they fought to the last. If but one remained he would run at her, not away. Maria loved her undeath, so much she wanted it to last forever. This would not happen if she took needless risks. She made her decision quickly and gave the command immediately. … while Adolfo led his ghouls down another parallel street – in fact, it was the very same street he had fled down the previous year when the Arch-Lector of Remas had attacked Viadaza. The irony was lost on him. The rest of her army, the duchess included, slipped away through interconnected cellars and attics, crossing vestibules and arches, down passages and alleyways, towards the waterfront where boats awaited them. Once again, the undead had yielded Viadaza to a Reman led army. But the duchess was far from defeated, merely inconvenienced. She would raise more servants wheresoever she went and destroy this foe in her own good time. Their losses in this battle would be much, much harder to replace. The Luminark channelled an extra dispel die, as did the magical finger bone carried by the Urbiman priest, which meant, along with just one 6 rolled by the three priests, on several turns the Holiest Army had +3 dispel dice! As the Holiest Army had won their casualty recovery was as good as the rules allow. 1/3 of all destroyed units’ models are recovered, and half of any models lost to units remaining on the field. After applying the recovery rules, they went from 170 flagellant cultists to 109. If they had lost, they would have been almost obliterated. 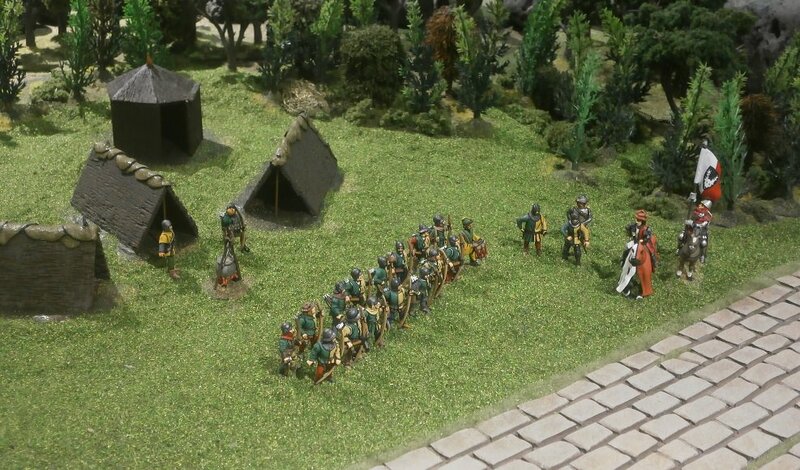 As it is they can still field a good fighting force, perhaps organising the cultists into two 40 strong hordes and a couple of smaller companies (the torch wielding bodyguard and a crossbow company?) They still have the Luminark, or ‘cannone luminosa’, and I reckon I can allow them to have a spare lens tucked away in the baggage for repairs. They have cannons, and mercenaries, and light horse. Father Carradalio still has an army. I’ll have to remove ‘The End is Nigh’ rule from the companies of crossbow and bodyguard because, basically, it is a SILLY rule for such small units. 1. I didn’t like how out of focus the pic was. I don’t really have time to check the quality whilst refereeing the game and had forgotten to take several pics (my usual technique for important moments). 2. 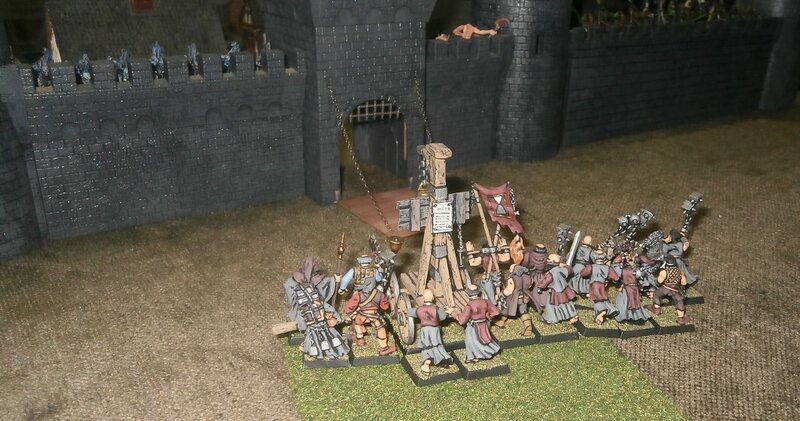 How the heck did the standard bearer locked into a pillory manage to climb a ladder and get over the wall? Frenzy sure makes men do some crazy things, but surely not the impossible? 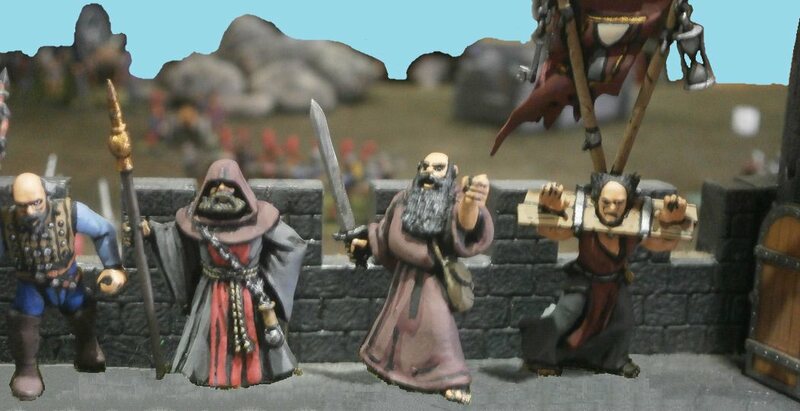 Now, I have painting to do for the next battle – new figures and scenery and modifying old figures. I have two players arranged, just need a third for an NPC force. Game in two weeks! I also have my GM duties re: the aftermath of this battle, and other unfolding events. Good job I love this hobby! Sneaky Duchess, running away eh? Not very sportsmanlike, though it looks like it may have been just as well for the forces of the living! It had been half an hour since the army came to a halt. The days of marching were long, but not too tiring, as the road coursed (in the main) downhill, and although ancient, being dwarf-built it was in good repair. Yet none of this meant a quick pace. You might presume that the dwarves were to blame, and you would be right. But it was not their short legs that caused the delay. It was the engines of war they were hauling. More accurately, it was one engine in particular - the massive ‘Cannon Imperial’ named Granite Breaker. Being summer it was still light even this late in the day, and just like the last nine evenings the entire army was now stretched out along the road side for the best part of a mile, preparing to camp for the night. Apart from the mounted Brabanzon mercenaries, the order of the companies never changed. Some nights the riders lit their fires at the head of the army, other nights elsewhere, presumably camping on some convenient height nearby from which they could keep an eye out for torch lights and such like. But every other body kept its allotted place in the line. The dwarven flying engine, which could hardly be called a ‘company’, also rested in a different place each night - wherever its pilot thought safely solid enough to re-acquaint it with the ground. The road would be the obvious choice, but then the sleeping engine would block the way should an alarm be sounded. Most of the army’s baggage was at the rear of the column. The heavily-laden wagons had spent each hour of travel discovering, with rattling clunks, every bit of damage done by Granite Breaker’s passage. Now they were very quiet, lined up in an orderly fashion typical of dwarfs. The horses and oxen had been unlimbered and led away to rest somewhere amongst the trees. 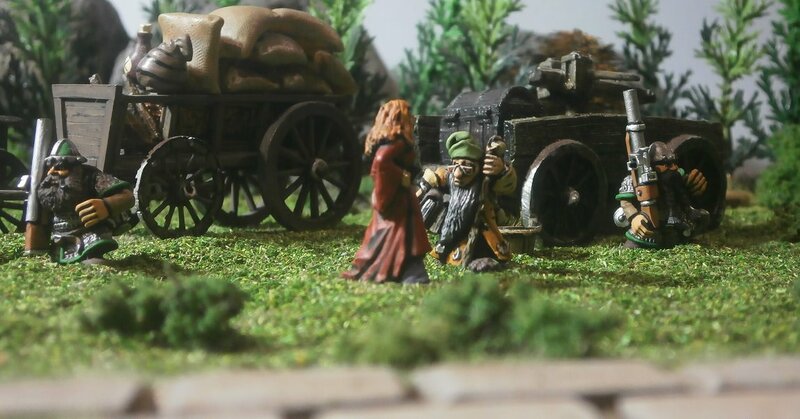 It was by the wagons that Glammerscale Hamgorn the dwarven wizard had met his equally unlikely counterpart from the company of Brabanzon mercenaries marching with the army of Karak Borgo, the red-haired, ‘fallen’ damsel Perrette L’Amy. Immediately upon laying eyes on him she had smiled, as if they were old friends, and approached him confidently. She wore a long dress of red wool, full sleeved but unadorned with lace or embroidery, hoist up a little to reveal an inner petticoat of purple. Her long, bright hair was loose and wild, and she had in her hand a part-extended fan, which she clutched to her side. Glammerscale assumed it must be some fashionable affectation amongst Bretonnian ladies, although from what he had heard she was no lady. Glammerscale pondered this for a moment. Perrette had not travelled to Tilea with Baron Garoy, but in the company of the Brabanzon mercenaries. He had heard them talk of her two evening’s ago. They did not call her witch or wizard, instead sorceress. Nor did they call her a lady, and as their drinking went on they used much more base terms. The young paladin Baron Garov refused to mention her at all. From the way he winced, it appeared he was even reluctant to hear her name merely mentioned. “The way of magic is not an easy path,” Glammerscale said diplomatically. Glammerscale noted she had not actually said whether she was a noblewoman or peasant born. Perhaps such mystery could only improve her reputation as a spell-weaver? To know too much about a person can make them appear mundane, and that does not do for a practitioner of the magical arts. “Are we two of those tools?” asked Perrette, a twinkle in her eye. Glammerscale doubted his explanation had convinced the damsel, as anyone who knew anything about dwarfs knew of their distrust of wizards. He would be ordered off with the scouts, yes, but the real reason was superstition. The thanes and their warriors did not want him bringing bad luck to the army on the day of battle. As Thane Narhak had put it, his presence upon the field of battle would be disruptive to the cause. “I did not think those you travelled with cared much for honour,” said Glammerscale. “Oh, they play their part well enough. The archers I saw had already put up their huts and lit their fires before he arrived, yet still they formed into a body before him. He made a comment or two to the sergeants there, to which they mumbled some sort of answer. I’m sure each and every Brabanzon once served some knight or another. They understand what is expected of them. “He is not their paymaster,” said Glammerscale. Glammerscale decided he liked this woman. He enjoyed her honesty, and the fact that when she did flatter she made it so obviously a game. “And what do you think of the baron?” he asked. “The forever chase! You know the stories!” said Perrette, surprised. “Are we to presume the baron chose wisely?” asked the damsel. Perette fell silent and studied him for a moment or two, which made him a little uncomfortable. He had had a chance to inspect the cannon imperial closely two evenings ago, in the company of no less than the army’s general, Narhak, Thane of Dravaz. She had been heavily guarded, as were the wagons of budge barrels that would provide her sustenance. The thane had waxed lyrical about her, telling of a great uncle who swore he had seen her take the top of a mountain off. She was cast in the form of a dragon and mounted on a carriage so heavy that it alone, if rolled down a hill against a castle wall, could possibly bring it down. The brass had long since tarnished to make her blueish in hue. None had thought to polish her, however, for in the old stories of her destructions she had been blue and proud of it, and no-one wanted to offend her. She required a regiment of draught animals to haul her, several of which were still nearby as she rested, being the last to have been unhitched. The animals were needed fore and aft of her on the road, in differing proportions according to the chief engineer’s judgement. When going down hill more were needed behind than in front. When the animals were changed, she was held in place by huge wedges, the four of which needed a wagon to themselves. Most of her powder was carried with that of the other guns, but at least one wagon was usually nearby too. Thane Narhak had said a powder wagon was kept close to reassure her. Considering he had just claimed she had once beheaded a mountain, Glammerscale had the measure of the thane's flights of fancy. 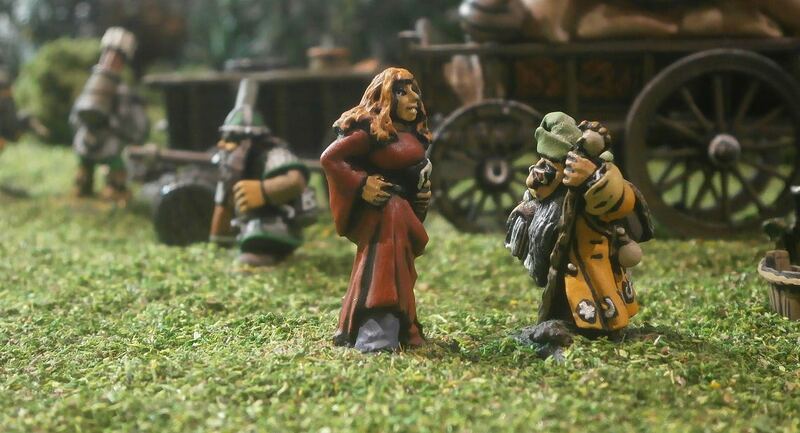 After half an hour in her close company, the wizard had decided that his absence from the battle would be of very little consequence with the likes of her blasting at the foe. A field gun was to an ogre as a handgun was to a dwarf, but Granite Breaker was to an ogre as a sledge hammer was to a mouse. Her Imperial Majesty was not going to Campogrotta to knock down ogres, however. She had to bring down the walls. Glammerscale had seen those walls himself, and to his knowledge only the mighty walls of Remas were bigger. He had passed the city in the evening, far enough away to avoid being spotted. The gate had ragged banners atop, bearing an image of red mountains - presumably one of Razger’s emblems and not that of the Wizard Lord Niccolo. … he had not discerned what exactly were the weapons they were carrying. It was Thane Narhak who had told him what the scouts had seen – cannon barrels carried like handguns.. Not that there was a smattering of such weapons, but that every ogre upon the walls had one. Glammerscale did not doubt Granite Breaker would fell Campogrotta’s fortifications. It would take time, however, and he wondered what the serried ranks of cannon barrels might do to those who assaulted the walls or clambered over the rubble during that delay. Looking forward to seeing how the supergun performs! The brute defenders upon the city walls had watched for the two hours it took to drag the mighty cannon Granite Breaker into position. They themselves had guns, cannon-barrels no less, which they wielded the way a man might a handgun, but they knew that the enemy was too far away for their shots to have any real effect. So they bided their time, unafraid, for why would brutes fear the antics of the little folk? 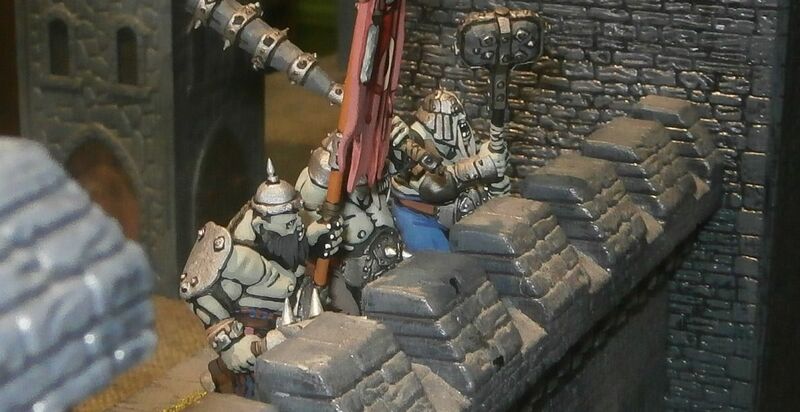 The attackers - the dwarfs of Karak Borgo, the paladin Baron Garoy and the Bretonnian Brabanzon mercenary company - had arranged their lines before Granite Breaker was hauled up, ready in full force to thwart any attempted sally from the walls to capture or disable her. 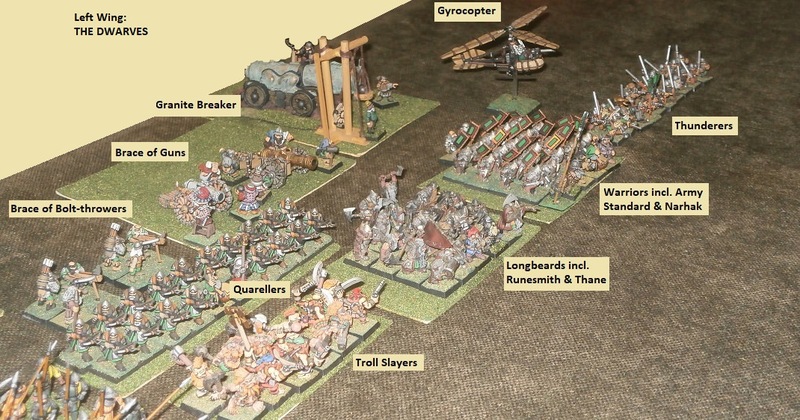 The dwarfs themselves stood closest to the great gun, forming the assaulting army’s left wing. Thane Narhak, their commander (Game note: A lord level character), and the army standard bearer led the warriors. To his right were the Longbeards commanded by Thane Thakolim and accompanied by the Runesmith Rakrik Bronzeborn, then next in line were the Trollslayers. On Narhak’s right were the Thunderers, forming the far flank of the army, each of them itching to moved up to within range of the walls. The other missile troops stood behind the main regiments, as their weapons could shoot much further than the Thunderers’ handguns. 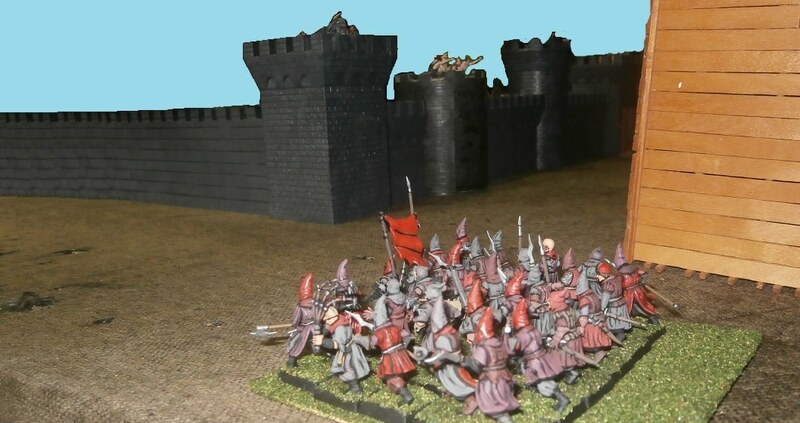 A regiment of Quarrellers scrutinised the walls from the rear of the Trollslayers, and behind them was a pair of bolt throwers and another of gunpowder pieces. Granite Breaker rested directly behind Thane Narhak and his warriors, who were bracing themselves for the passage of some very large round-shots over their heads. The flying machine fluttered around the army’s flank, its pilot looking beyond the walls to take the measure of the city’s towers – if he was to fly over the walls and into the streets he would need to give the towers a wide berth, otherwise his machine’s spinning wings would shatter. On the army’s right were the Brabanzon. 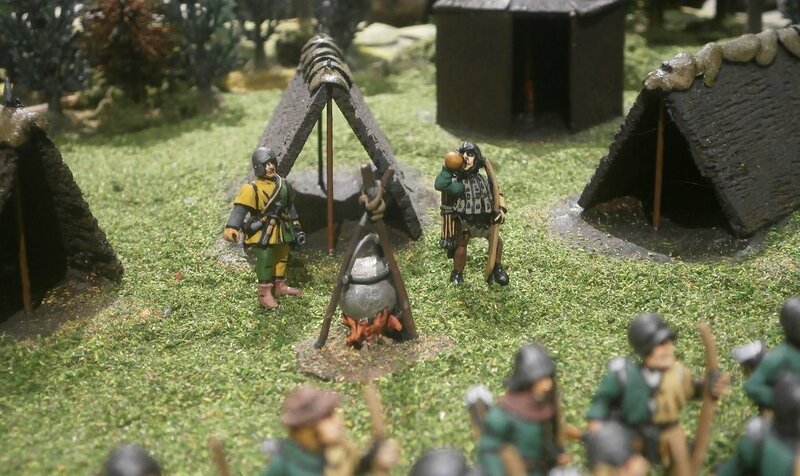 Captain Lodar ‘the Wolf’ and his ensign Jean de la Salle led the company’s largest regiment, the spearmen, nearest to the centre of the line, and out to their right were the two large bodies of archers and the smaller company of veteran men-at-arms. 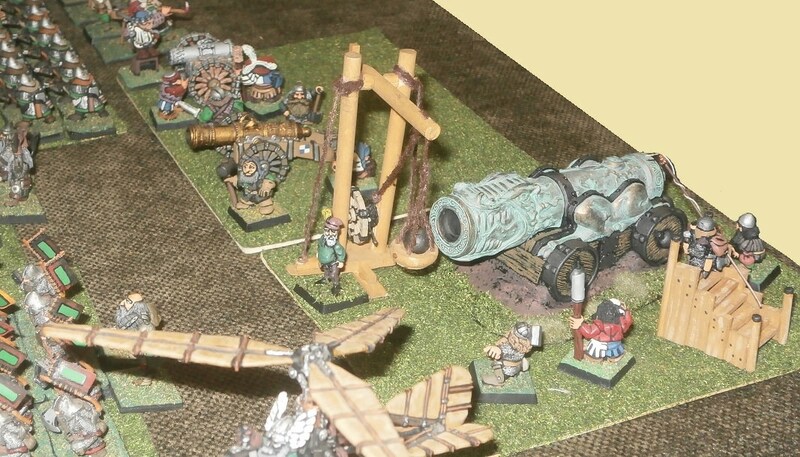 Their small gun, which they called 'the Piece', like unto a flea compared to the dwarfs’ cannon imperial, had been placed directly in front of the trebuchet all the better to perform its usual role as a guard for the larger engine. 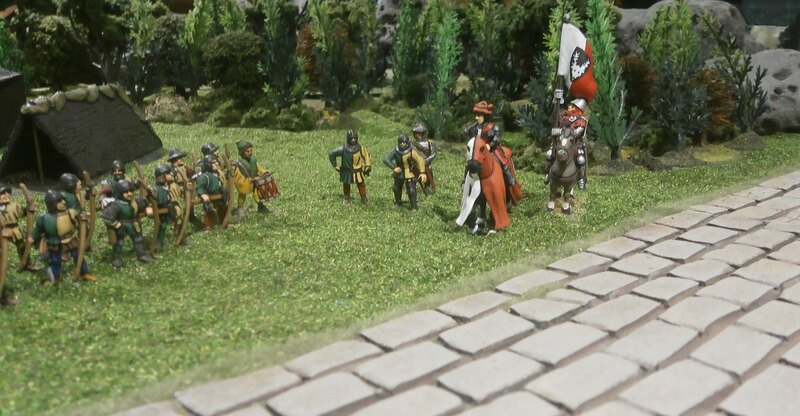 Baron Garoy and his brightly liveried retinue of young knights rode on the far right of the line, to a man wondering what their role in such a fight could be. It seemed to them, despite their hopes, that the enemy had no intention of leaving the walls to sally forth, a reluctance which mirrored their own stubborn reluctance to dismount to fight on foot and climb the ladders. 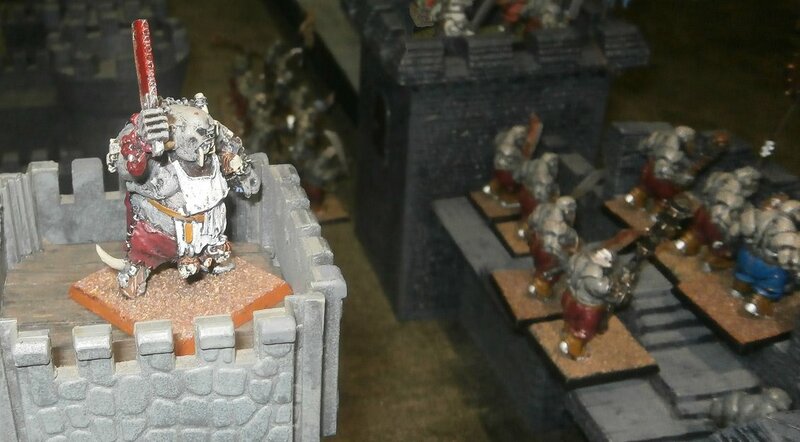 Considering the fact that Razger Boulderguts had marched the fighting army of Campogrotta out upon his grand raid, the garrison soldiers on the walls were surprisingly numerous, as was the number of leadbelchers amongst them. 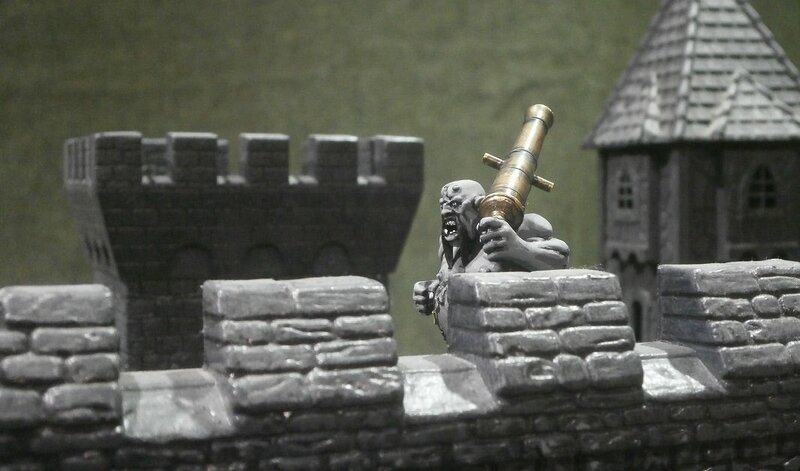 The southern-most tower was packed with the cannon wielding brutes, as was the next tower to the north, while the wall in between them was guarded by a small body of Ironguts (the latter being part of the city’s standing force). 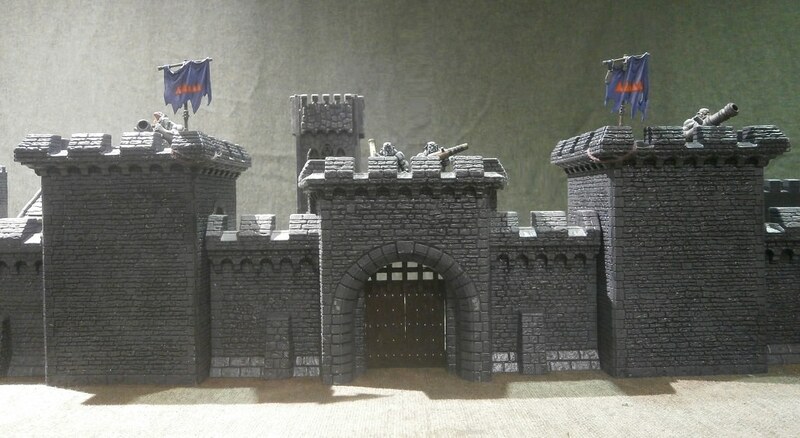 The gate was held by a large company of ogres and a slaughtermaster, while several Maneaters (being the city’s chief ‘constables’) occupied the tower by its side, each sporting a brace of handguns which they could tote like pistols. 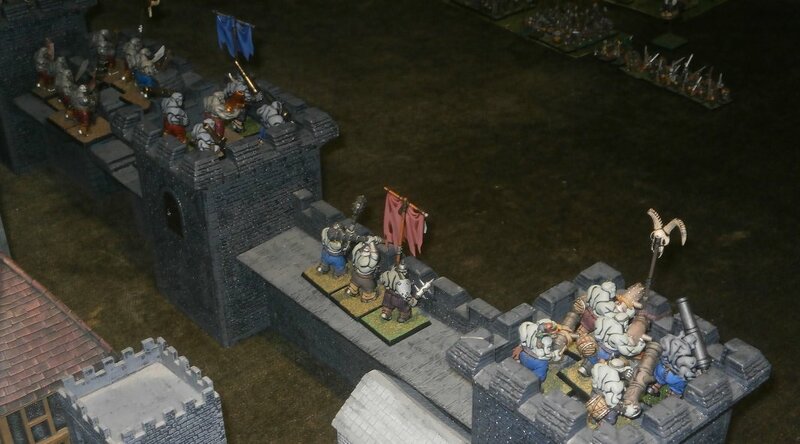 The long, northerly stretch of the city’s eastern wall was manned by an even larger company of a dozen ogres, and further half a dozen leadbelchers. The garrison commander, a Slaughtermaster known as Lord Wurgrut (although the title was an affectation and the rest was only part of the name he professed) had climbed to the very top of the tallest tower in the city’s eastern ward from where he could survey not only the full extent of the eastern walls but also the enemy in its entirety. … and the Ironguts on the wall adjacent. He decided that they were not best placed to serve in the defence of the city. 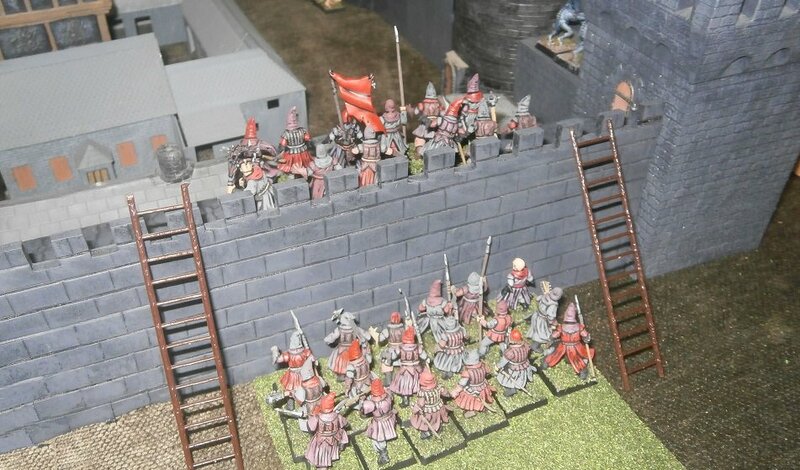 The wall was where the enemy might gain ingress, which was why the Ironguts where there, but the leadbelchers could hold it just as well, and would have just as good a view of the enemy from the wall as from their tower. 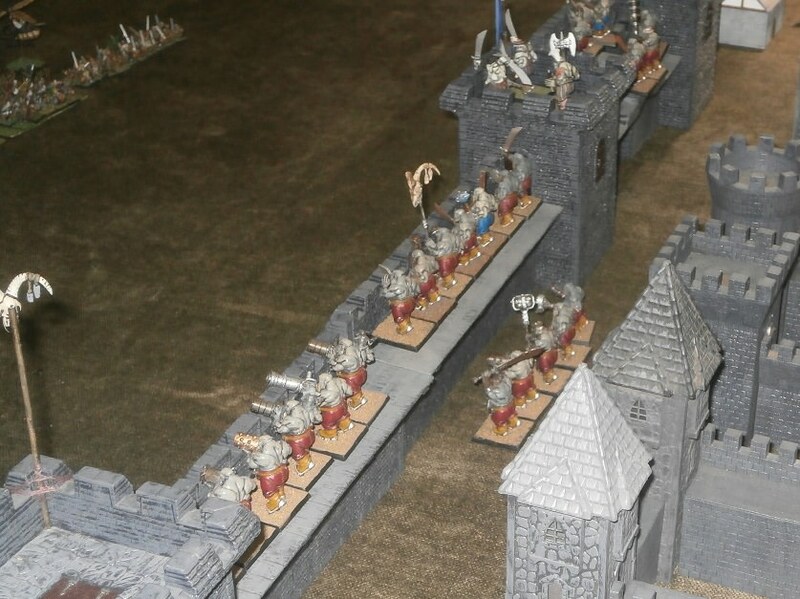 So he bellowed orders down, sending the Ironguts along the street behind the wall as a reserve ready to defend wherever any pressure might be felt, while the cannon wielders on the tower were to shift themselves over to the wall. Now at last satisfied with the disposition of the forces at his command, he thought he might start the fight with a bang. Pausing a moment to recall the strange words of the necessary incantation, then allowing the winds of magic to infuse his bulky frame with potency, he called upon a comet to crash from the heavens. For the briefest of moments he gave himself up to elation, for he could see the comet’s bulk in his mind’s eye. Then, as if he had awakened suddenly from a dream, the comet was gone, snatched from reality the very moment it began to manifest by the dwarfen Runemaster, who employed a talisman to break the power of the spell. Just as Wurgrut began scouring the enemy lines to spy out who might have been responsible for the thwarting of his spell, the enemy began to move. 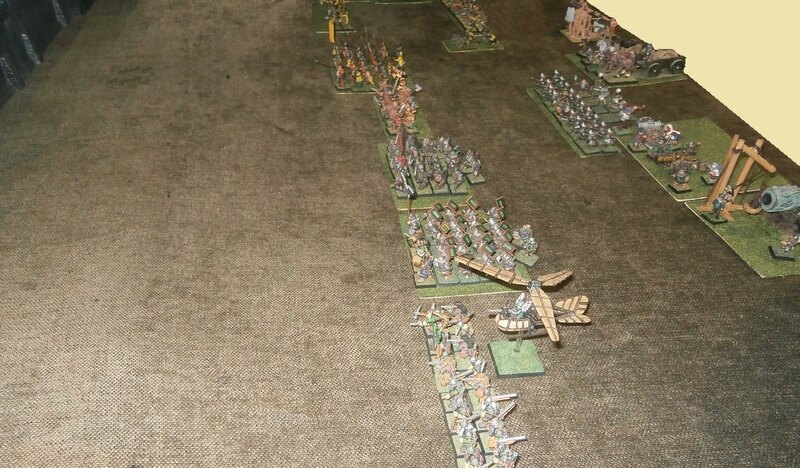 They advanced almost as one, although out on the right the Bretonnian mercenaries struggled to match the naturally slower pace of the dwarfs and came on a little faster. ... but the enemy’s second in command, a Slaughtermaster like their general, managed to sap the winds she was employing and her efforts came to nought. 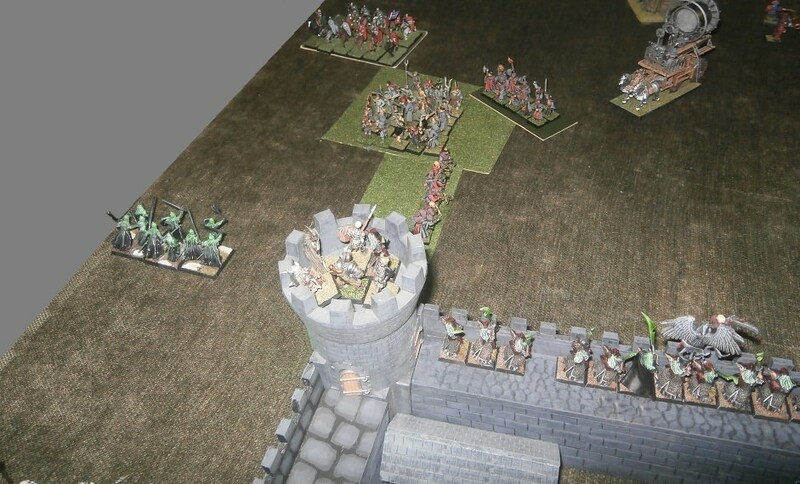 The ogre magician could do nothing to prevent the firing of the cannons, however, and all three muzzles were sighted upon the long, northern wall. 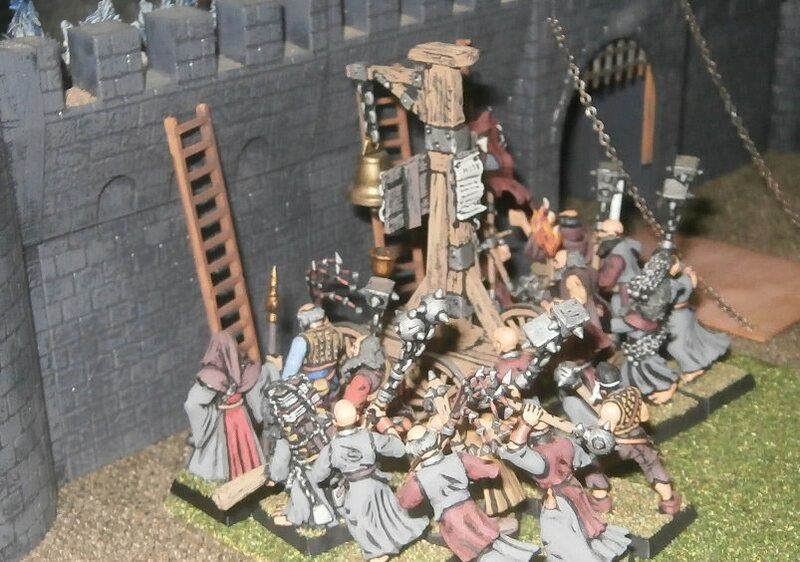 The trebuchet crew, whose first shot had merely bounced from the wall, could only look on with envy as all three roundshots smashed into the stone to leave visible cracks and dents. The wall’s defenders, the largest company of bulls in the garrison, peered uncertainly over the crenulations or picked at the cracks that extended up even as far as the parapet and, deciding they would rather defend the fallen ruins than become buried within them, they backed off the wall to take up position behind it. They were not the only ones scrutinising the damage. Baron Garoy, riding his mighty destrier and clad in his heavy battle armour, his shield bearing the image of a white stag’s head and his helm bearing antlers in his livery of gules and argent, had lifted his visor to get a better look. What he saw gave him hope that he and his knightly retinue might be contributing to the fight a lot sooner than he had thought. 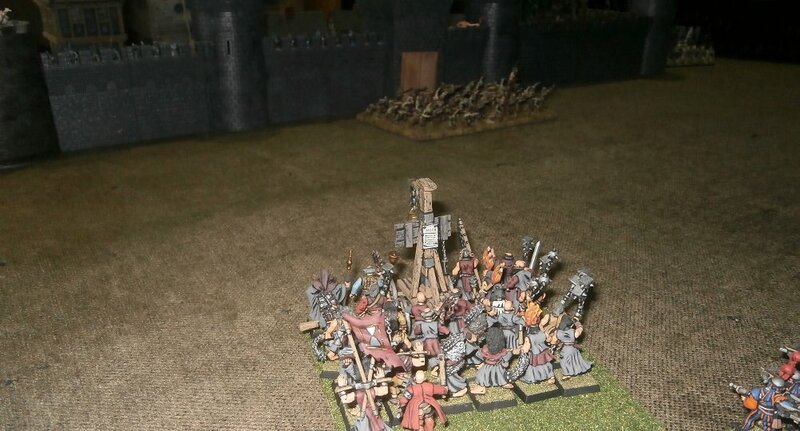 The dwarfen crossbows launched a packet of bolts to sting the Maneaters in the tower by the gate, while the Brabanzo longbowmen’s arrows merely clattered and rattled on the wall being vacated by the bulls. The dwarfen thunderers could contribute nothing to this sharp-tipped hailstorm, however, for they were too busy moving forwards just to get into range of the walls.